Have you ever seen those spikes cities put on sidewalks and park benches to keep the homeless from loitering and sleeping? I remember encountering these for the first time at a small park in Chicago when I was an undergraduate. I sat down on the bench, carefully avoiding the spikes, and thought to myself, “Why would these be here? It makes it hard to be comfortable.” It was a relatively new thought to me, the idea that supposedly “public” spaces might not be neutral territory. But surely someone had put these spikes here for a reason, meaning someone had made a decision about this space and how it was meant to be occupied. Around this time, I had been reading Michel Foucault’s Discipline and Punish for a philosophy course, and a word came to mind for the benches, which so clearly discriminated against the homeless: disciplinary. Those spikes were meant to shape users’ behavior. The metal-dressed benches welcomed those who used the space appropriately, staying shortly to watch their children play or to eat their lunch, and to discourage those who used the space “inappropriately” by overstaying their welcome or disrupting class-based hierarchies with their presence. Sitting at the park on that gray day, I made a connection I hadn’t made before, despite years of witnessing and experiencing street harassment and its many forms: street harassment is also a predatory, disciplinary social behavior that shapes women’s experiences and mobility. At this point in my life, I had not taken any Women’s and Gender Studies courses, and I didn’t yet identify as a feminist, so my realization was fairly simplistic: I thought, street harassment is like these spikes—it can make women feel unsafe, unwelcome, and uncomfortable in public. The fact that men engage in this behavior and it is trivialized in our culture makes the behavior, whether intentional or not, predatory and disciplinary toward women as a group. And street harassment is an overwhelmingly common behavior in the United States, affecting women across age groups, socio-economic status, religion, race, and sexual orientation. According to a 2014 survey of 2000 American women, more than 65% reported experiencing street harassment (stopstreetharassment.org). After this day in the park, and over the course of several years in graduate school spent studying feminist theory and cultural geography as part of my PhD in English literature, I realized more and more that public spaces are not innocuous, they are not innocent, they are not transparent, and they aren’t abstract. Spaces are concrete, social, and political. They are socially constructed and maintained through every day, material practices, and the way we move through space is dependent upon our relationship to social structures and systems. In a patriarchy, public space comes to embody, through material practice—including street harassment and catcalling—heteronormative and sexist values that instill fear in many women and gender nonconforming individuals. As a consequence, agency and mobility become restrained. In order to make spaces socially just, we must interrogate and expose the politics of public space. As Ed Soja explains in his book Postmodern Geographies, “We must be insistently aware of how space can be made to hide consequences from us, how relations of power and discipline are inscribed into the apparently innocent spatiality of social life, how human geographies become filled with politics and ideology.” In a patriarchal society, this means thinking critically about the behavior of street harassment as a political and social act that disciplines women’s and queer people’s bodies in immobilizing and debilitating ways. Throughout graduate school, I searched for academic scholarship on the topic of “catcalling,” but I always came up short. During my doctoral exam period, however, I came across an article from the 1980s that used the term “street harassment,” and doors opened. I knew I wanted to read the existing scholarship on this topic, and I knew I wanted to teach a course that would inform students about the socio-political construction of American space that makes street harassment at once so prevalent and so under-researched. Around this time, in 2014, the nonprofit organization Hollaback! released a video that went viral featuring a woman being street harassed in New York City. This film sparked national conversation around the topic of street harassment, and behavior that had historically been trivialized began to be taken more seriously. I taught my class focused on street harassment in spring 2016, just a year and a half after the film’s release. 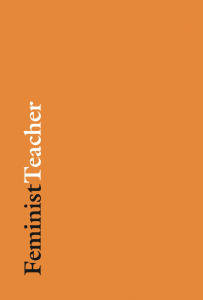 My article explains my rationale for the course, how I designed the class and assignments, and students’ reactions to participating in a class that treated street harassment as a scholarly and political topic. I am pleased that today, a mere three years later, the landscape of the conversation around street harassment has changed dramatically. Due to films like Hollaback!’s, activism led by nonprofits such as stopstreetharassment.org, and feminist movements such as #metoo and #everydaysexism, street harassment is much more visible. Academics, feminists, activists, and mainstream media report on street harassment regularly, and definitions for the practice are much more readily available (street harassment even has a Wikipedia page these days!). I hope this conversational shift will lead to positive change and more inclusive models of public space.